So back in April, I wrote about a body interface project that I worked on called weBlimp. So in the time since then, the weBlimp team has brought it from a final project in a class, to an academic conference presentation, and now to an Olympic event! 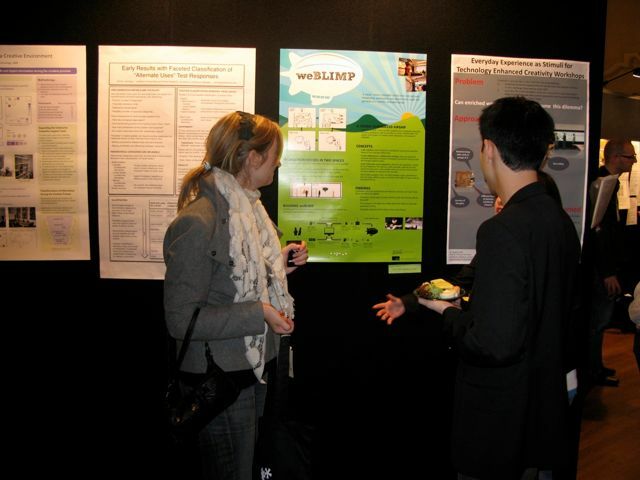 So to update, in October, we were at UC Berkeley to present the concepts behind weBlimp at the ACM Creativity & Cognition 2009 Conference. The conference was great. It really has me considering grad school now. I also really enjoyed checking out San Francisco and the Bay Area. A month or two after, we were asked by our University and the City of Surrey to showcase weBlimp during the 2010 Winter Olympics! Currently, we are working on building of a 'weBlimp 2.0' of higher quality and robustness, in preparation for its installation at the Surrey Holland Park Olympic Celebration Site. The installation will be showcased during the Olympics from February 17-21st. Here is the original documentation video on weBlimp. We will try to have a new one after the Olympics.